They taste a lot better than they look, it has to be said. One or two people have asked why there are no parsnips in Veggiestan. They are not in fact indigenous to the region: although they were introduced into the Greek and Roman diet at some stage, they failed to travel East in any significant way and many Veggiestanis to whom I have spoken on the issue regard them as nothing more than rogue carrots. This would not have deterred me from putting them into the book: I do recognise their versatility and, er, unique flavour. But the truth is that I really don’t like them (please don’t all rush in and beat me up with a wurzel, now will you?). I feel the same way about parsnips as I do about the Beatles: they are great and good things, but they are not for me. 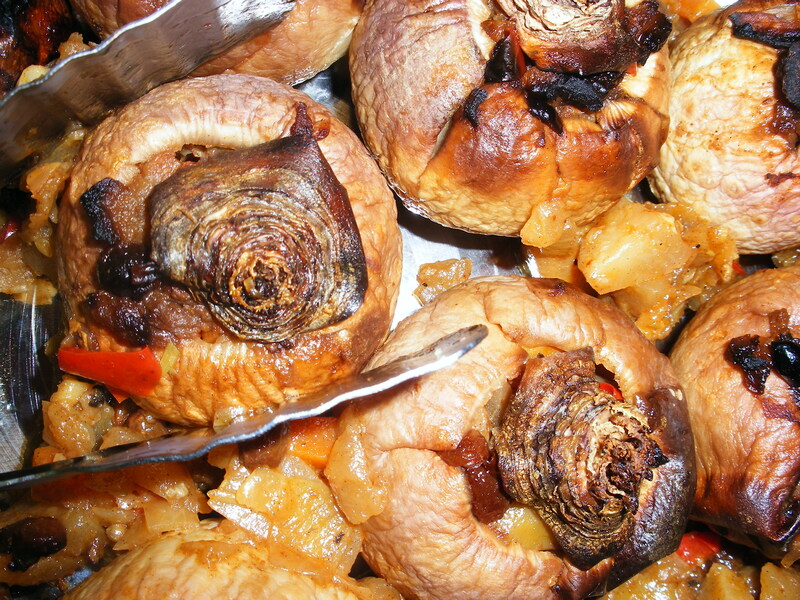 Turnips, on the other hand, are to be found all over Veggiestan. And I absolutely love them. They are a famous remedy for chesty coughs, and are eaten throughout the Winter to guard against such. Dr. Khoshbin, who is the author of several excellent and authoritative books on home remedies, not to mention the owner of an impressive perma-tan-pearly-smile combo, makes much of neeps, touting them as anti-everything-you-can-think-of. This is a cracking, cold-busting, wallet-friendly, post-Christmas supper recipe. It is also just smart enough to pass off as dinner party food. I started baking turnips initially for poor Mr. Shopkeeper, who has long been on a diet (and has done very well, it has to be said). They are great just with a little salt and grated nutmeg. The naughty Kashmir-style filling came later. Okey Cokey. So first off you wash the neeps gently, and then top ‘n’ tail them, removing as little as possible from the bottom (just enough so they sit up and beg without rolling over), and enough of the top so you can get a knife in and poke around (you’ll need to expose around around 3cm in diameter of the flesh). Make sure you retain the tops of the neeps to act as lids. Using a vegetable parer, carefully cut out the middle of the turnip, keeping the bits you dig out. Once you have removed some of the flesh, use a pointy teaspoon to excavate the rest to within a few millimetres of the sides and bottom: you should end up with a decent, fillable cavity. Sit the neeps in a small oven dish while you get busy with the curry. For this you need to chop the reserved turnip flesh, and then fry it in a little oil along with the onion, garlic, ginger, celery and carrot. Once the veg have softened add the apple, followed by the spices, stirring well, and finally the mango pickle. Add around a a glass of water, check the seasoning and leave to simmer for around 15 minutes. Preheat your oven to gas mark 6 (200 C). Spoon a generous amount of the curry into each of the turnips, topping each with the reserved ‘lids’. Bake for around 1/2 an hour, or until the turnip flesh is crispy on the outside and tender inside. Serve immediately, with any of the curry that was left in a bowl on the side. This works with salad and warm bread, or as part of a Winter meze. This entry was posted in Recipes and tagged baked stuffed turnips, cold remedies, Dr. Khoshbin, Kashmiri curry, mango pickle, neeps. Bookmark the permalink.